How does sound affect our perception of food, and how does taste affect our experience of music? Tasteful Turntable is a sensuous performance that explores this sense-interference between music and gastronomy. For the composer, the tastes are used side by side with the sounds in the score. For the chef, the sounds are used to flavour the other ingredients. A slowly turning dining table is designed specially to provide the guests with parallel stimuli through the ears and mouth. It is played every hour on the hour, six times a day. First performance starts at 15.00, the last at 21.00. Reservation is required. Please reserve a seat HERE. Directed, composed and designed by Lars Kynde and Nikolaj Kynde. Food composition by Mette Martinussen and Augusta Sørensen. Performed by Lars Kynde, Nikolaj Kynde and Augusta Sørensen. 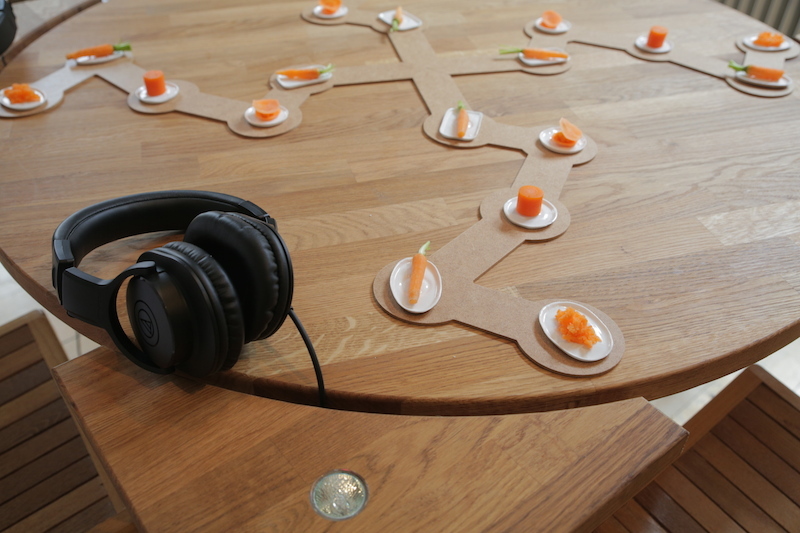 The Tasteful Turntable has been produced during a residency offered by iii in collaboration with the Wundergrund Festival, Copenhagen Cooking and thanks to funding from the Creative Industries Fund NL and Stroom Den Haag.